You just need to read some of the reviews at the bottom of this page to realize that this is a very popular and robust kitchen. It doesn’t quite have the same functionality as the Step 2 Kitchen but it will be more convenient for some parents who are concerned with maximizing available house space. How does the KidKraft Uptown Espresso Kitchen help with your child’s development? This is a great way for children to develop their literacy skills. To begin with the younger children will scribble on the board and as they grow and develop their skills this will progress into forming shapes, letters and numbers. Will help and encourage the children when they are developing their communication skills. It is a fun way for children to use their imagination and pretend to talk to other people on the end of the phone. This will help children to develop their motor skills in a fun way as they chop up the food. Using utensils along with the chopping board is a great way for children to develop fine motor skills as they grip the knife and food that they are preparing. With the kitchen being are large enough for more than one child this helps and encourages co-operation through play and also develops communication skills as they talk to each other. Children can use their imagination whether playing alone or together in a variety of role play situations that they choose. The KidKraft Uptown Espresso Kitchen is a well priced Toy Kitchen which has good functionality to let your child have fun and learn some essential skills at the same time. It is more compact than some of the more expensive kitchens and would be ideal for a family trying to save a bit of space but the kids will still love it. 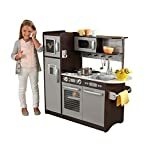 At the moment you can save up to $30 on this Kitchen at Amazon.com.. I am thrilled with this kitchen. I have a 3.5 year old daughter and 2-year-old son. This kitchen is just the right size for them to play with together and not push and fight constantly. I selected it because I have a boy and girl and did not want to go with a pink kitchen, which so many of them are. I also love this kitchen for the details. The water/ice dispenser is not just a drawing as it is on so many kitchens. You can actually put a cup in there and pretend you are getting water. It has a phone which my kids love. My daughter “called” her Grandma and Papa who live in another state several times on Christmas morning to talk to them about the sandwich she was making Papa and the cookies she was making Grandma. The chalkboard is real and they have had fun writing on it. There is even a removable cutting board in the cabinet underneath the sink! I highly recommend..
We’ve had this kitchen for 8 months now and with the daily abuse that it takes from my children, I’d say that it has held up very well. When we first put the kitchen together, we noticed that one of the stove knobs was smashed — like someone had stomped on it. We called Kidcraft and they quickly sent us a brand new part within a week. Anybody that has seen my children’s playroom always compliments on how amazing the kitchen looks. It’s a step above the plastic play kitchens and comes in a gender neutral color, which is great for my son and daughter. I’d give this product 5 stars..
1. Size. Something substantial enough that they wouldn’t grow out of too quickly. Height as well as ability for multiple kids to play was critical. Also needed enough space to actually “play”. A lot of the kitchens I saw were small with some burners and a sink but no flat area to “cut” vegetables or place items. 3. Gender neutral. Not a deal breaker, but would be nice to have something my son could play with that wasn’t pink. 4. Price. Again, not a deal breaker, but who wants to overspend? Finally, after comparing and looking at the KidKraft Big Kitchen (too pink), KidKraft Vintage Kitchen (way too small), Pottery Barn kitchen (too expensive and too many pieces), KidKraft Grand Gourmet Corner Kitchen (too many small drawers) &Melissa & Doug Classic Kitchen (not bad, was a close second to my purchase, but my husband didn’t like the colors) among a few others, we finally chose this one.